Hi, I am back from 5 months in the States – 2 months helping a friend build an in-law unit and porch, 2 months sitting mindfully with monks at Tathagata Meditation Center in San Jose, California, and one month camping and traveling with my son, Ky, and his family. For January and February we have been working diligently at getting the Ranch to the next level. The garden behind the palapa is growing fast and we will taste our first greens in a few days. We also had our first coconut harvest! 20 sweet, refreshing orbs of goodness. I am coming up with all kinds of ways to use the meat. A favorite has been coconut rice pudding. It took a bit to find the right recipe for the clay floors, but it was worth the effort. The oil to finish the floor is on its way and then ready for yoga. We are making some improvements to the roof and the loft. And we will finish the new, quite upscale, outhouse next week. April 4. 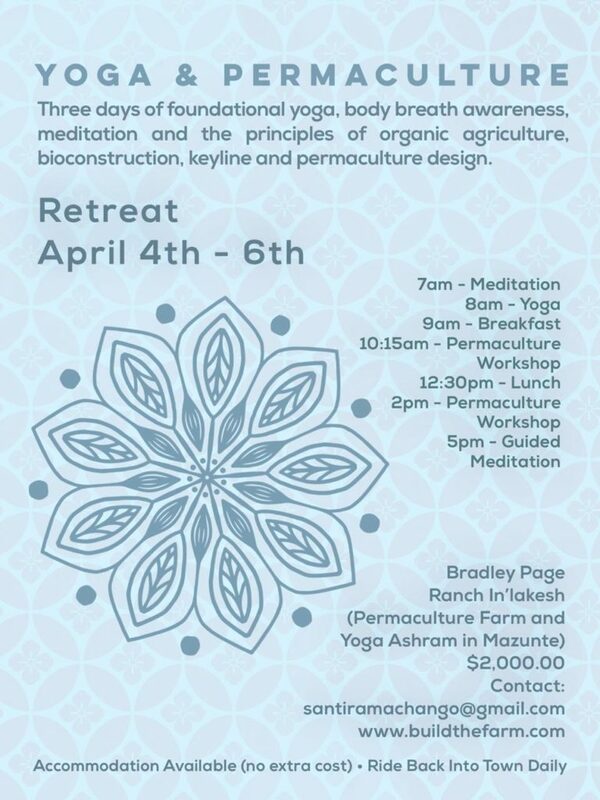 And a 10 day silent retreat April 17. Disculpe, pero ahorita toda la informacion es en ingles. Pero todo los programas y la vida en El Rancho son bilingue. Marcame o enviar mensaje y puedo ayudarle. 958-109-8603 bradley.page@gmail.com. Been thinking of coming to visit or participate in one of our retreats? Our 2019 retreat schedule is now up! We have a variety of 10-day, 4-day, and long-term retreats and courses available and would love to see you join. Any questions or to reserve your place, please get in touch! For more information on the retreats offered, check out our Retreats page.